Bangalore NCLT has made remarkable verdict where it ordered to pay a compounding fee of Rs 4,72,675 for Not Appointing Company Secretary . It was argued by the petitioner company that even though it had appointed many company secretaries , they left the company in search of green pastures. The Practicing Company secretary of the Company has informed the NCLT that the petitioner company is a subsidiary of M/s Sandur Power Company Limited and did not have adequate business activities and due to limited exposures , the appointed company secretaries are leaving the company in a short period. As such , the company is not able to get full time secretary during the intervening period. It reflects that Petitioner Company has taken reasonable efforts to comply with the provision of the section 383 A of the CA 1956 but could not get a Company Secretary for the continuous period. 383A. 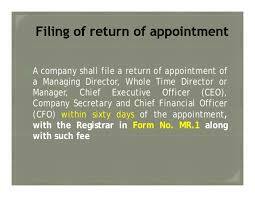 Certain companies to have secretaries (1) Every company having such paid-up share capital as may be prescribed (Rs. 5 crores) shall have a whole-time secretary and where the Board of directors of any such company comprises only two directors, neither of them shall be the secretary of the company: Provided that every company not required to employ a whole-time secretary under sub-section (1) and having a paid-up share capital of 10 lakh rupees or more shall file with the Registrar a certificate from a secretary in whole-time practice in such form and within such time and subject to such conditions as may be prescribed, as to whether the company has complied with all provisions of this Act and a copy of such certificate shall be attached with Board’s Report referred to in Section 217. It is to be noted that argument by the company that it took earnest efforts to appoint a company secretary and is using the services of a practicing company secretary was not accepted by the NCLT , Bangalore. Now , the available company secretaries has touched the land mark trend of 50000 numbers , companies in India cannot argue that adequate company secretaries are not available for employment and they are taking earnest efforts to find a company secretary or using the services of a practicing company secretary. There are lot of company secretaries who have qualified recently are find it difficult to sit in a job and they are jobless. They are vexed to blame themselves for successfully completing the company Secretaries course. 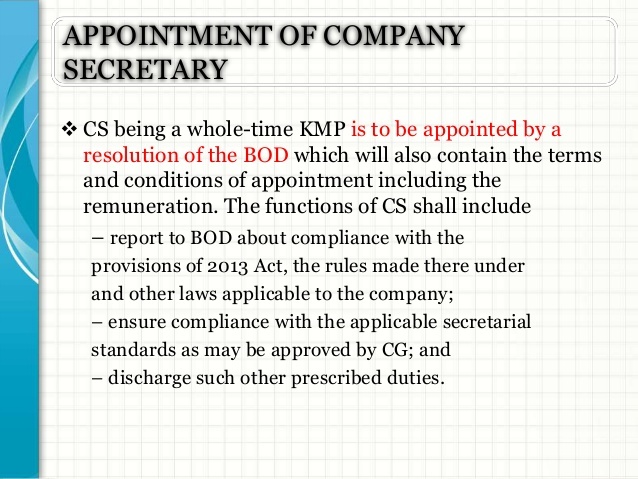 If any member finds that a company avoids to fill in a company secretary position , they can bring it to the notice of concerned Registrar of Companies. NCLT , Bangalore decision is a land mark decision and it is an eye opener for those erring companies which has not appointed a company secretary.